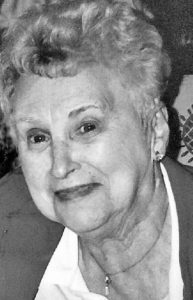 Marybelle Saunders, age 95, of Brodhead, passed away on Tuesday, March 13, 2018, at Woods Crossing Nursing Home, Brodhead. WI. She was born on January 2, 1923 in Brodhead, WI, the daughter of Bert and Mae (Christman) Bouton. She married Francis “Sandy” Saunders on November 19, 1941. He passed away on June 3, 2008. Marybelle graduated from Brodhead High School, where she had been active in many school activities. She also had been the prom queen. In their retirement years, Marybelle and her husband enjoyed traveling to Florida in their motor home, where they made many friends. She enjoyed going to the YMCA for many years with her ‘swimming pals’ and out for lunch afterwards. Marybelle thoroughly enjoyed being a Mom, homemaker, spending time with her grandkids, visiting with her great-grandchildren, loved her dogs and granddogs, and was very supportive of her husband’s business. Marybelle was also a member of St. Rose of Lima Catholic Church, Brodhead. 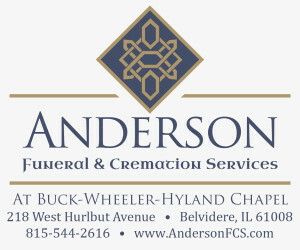 She is survived by her her children; Gary (Marilyn) Saunders, Brodhead, Stephen (Denise) Saunders, Garnavillo, IA, Becky (Bill) Prochnow, Oregon, WI, Sharon (Ric) Genthe and Mark (Martha) Saunders, both of Madison; two nieces, Vickie Neitzel, Janesville, WI, Phyllis Heitke, Stoughton, WI; a nephew, Richard Bouton, King, WI; thirteen grandchildren and twenty-five great-grandchildren. She was preceded in death by her parents, husband, two brothers, Curtis and Stanley Bouton, two sisters, Charlene in infancy, and Mildred Chase. A special thank-you from the family to Wood’s Crossing for providing such excellent care for Marybelle. She thought highly of the staff.